Before Mt. St. Helens erupted, it was reported in the nutritional community that Idaho potatoes (baking potatoes) had zero nutritional value, as in nada, nothing. The volcano rained a payload of ash replete with abundant minerals and this restored the soil, at least temporarily. According to the Washington State Potato Commission, potatoes have more potassium than bananas. They supply a surprising amount of vitamin C and even A, B, and P as well as quercetin. Not surprisingly, the potatoes with red or purple skins have flavonoids and all sorts of other wonderful phytochemicals. Moreover, they have no fat or cholesterol — unless you use luscious sauces — but who actually eats a potato without jazzing it up a bit? What I bet most people don't know is that potatoes have easy to digest protein and the purple ones have more than the others, as much as 20% more. The fiber is in the skins so don't peel the potatoes. The potato is originally from the Andes. I learned that in a bizarre course in college called "The Influence of Western Civilization on the History of the World" but what I learned instead is that Italy didn't have spaghetti before Marco Polo, and it didn't have tomatoes or potatoes until Columbus et al. Potatoes were introduced to Europe in 1570 but it wasn't until the seventeenth century that they were used to avert famine because they pack a lot of carbs into small bundles. "UK scientists at the Institute for Food Research have identified blood pressure-lowering compounds called kukoamines in potatoes. Previously only found in Lycium chinense, an exotic herbal plant whose bark is used to make an infusion in Chinese herbal medicine, kukoamines were found in potatoes using a new type of research called metabolomics." 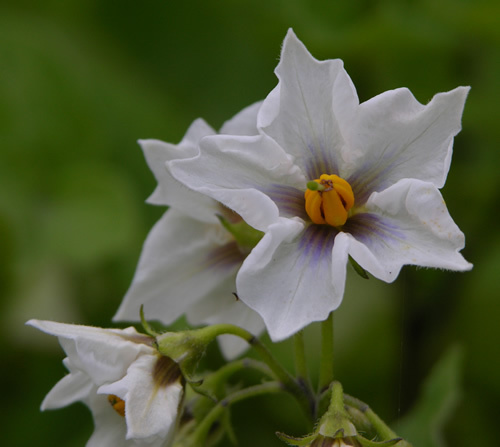 Potatoes are a member of the nightshade family and leaves contain solanine, a substance that can be quite toxic. If the potato is green, it could also be toxic. This plant is in its prime.